It’s that feeling you get when you leave the store lugging a shopping bag, an overstuffed diaper bag, and an infant in a car seat, and a stranger offers to help you carry it all to your car. Or when your partner knows you’re having a rough week and comes home bearing a bouquet in one hand and Ben & Jerry’s in the other. Or when you take a few minutes at the end of the day to listen to your sweet children breathing as they sleep. Psychological research shows a strong association between cultivating gratitude and greater happiness. When we’re grateful, we’re often healthier, more positive, and more resilient. All things we want not only for ourselves, but also for our children, right? If you’re reading this post, it’s quite likely that your family is within the top one percent of the wealthiest in the world. Thankfully, you and your children are probably not struggling with starvation or malnutrition or a lack of clean drinking water. What that means, however, is that it’s all too easy to unintentionally raise ungrateful children—children who feel more entitled than thankful, children who confuse their privileges with their rights. Believe me, I get it. Some days I have a heck of a time getting my kid to say thank you without being reminded. Some days I look at the sea of toys in my house and feel crushed by the guilt of having so much stuff. To combat that issue, I’ve been brainstorming some fun and simple ways to teach kids about gratitude—during the Thanksgiving season and beyond. Maybe one of these activities will work for your family, too. Get an oversized mason jar and decorate it with your kids. If you’re feeling especially kind, you can even let them use glitter. Then explain to them that this is the family’s Thankful Jar for the month. Sit it somewhere accessible along with pieces of paper, pencils, and crayons for the younger kids. Then encourage everyone to fill the jar—be it with words, drawings, or both—with things they’re thankful for. Designate a time, maybe once a week or so, to sit down as a family and look through the slips of paper in the jar. Point out ideas your kids had that are especially thoughtful or creative. Encourage everyone in the family who’s old enough to write to keep their own gratitude journal. Use cut-outs from magazines to decorate the front of a notebook, and then foster a daily or weekly habit of writing down a few things to be thankful for. This idea works well for older kids who might not want to share their thoughts out loud all the time, but it can also work for little ones who have Mom or Dad help them write their gratitudes down. I’m not particularly artistic, but I know there are lots of families who love doing arts and crafts together. Making a joint gratitude collage is a great way to get creative as a group while simultaneously helping children think through what they’re grateful for in life. The collage can be any size you’d like, and can be layered with hand-drawn pictures, magazine cut-outs, photos, or all three. Advent calendars are all the rage at Christmas time, but you can take that same idea of counting down the days and apply it to thankfulness instead. Just replace the little treats you often get leading up to Christmas with a daily ritual of expressing gratitude. There are all sorts of forms your calendar can take, like a bunch of small boxes with slips of paper inside for writing gratitude notes, or maybe a “gratitude tree” where you write things you’re thankful for on the leaves. It’s important to teach our kids the importance of not only feeling gratitude but also expressing it. To that end, get a bunch of small postcards and encourage your children to create brief thank you notes and pictures for people who deserve their gratitude. Then you can pop them in the mail, or better yet, hand-deliver them. 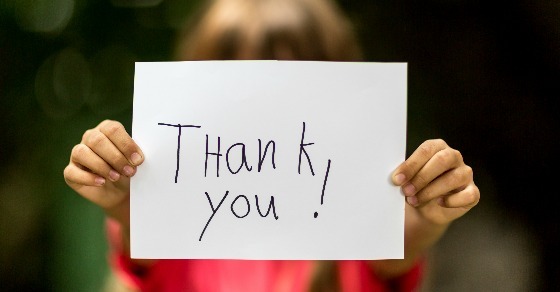 The experience will help your kids see how saying thank you can help them feel good too. Check out these free printable thank you cards for kids to color and send! Get kids in the spirit by turning your thankfulness exercise into a game. Let’s say you’re playing ping pong. Make a new rule that the person serving the ball has to say something he/she is thankful for beforehand. Or if you’re playing Candy Land, make a rule that you have to say something you’re thankful for every time you draw a green card. Or go around the dinner table saying things you’re thankful for that start with every letter of the alphabet. The point is to find a game that’s developmentally appropriate for your children and makes expressing thankfulness an interactive experience. Another idea for the crafty families out there! Make a bunch of big hearts out of paper, fabric, felt, or whatever materials you have available. Then have your kids decorate them with crayons, markers, buttons, sequins, stickers, etc. It’s up to them to choose people they’re especially thankful for to give the hearts to as gifts. There is perhaps no better way for all of us to cultivate gratitude than to serve others. Teach your children the value of service to those less fortunate by regularly finding opportunities to serve together as a family. As your children get older, have them offer ideas for ways or people to serve—such as collecting canned goods for a food bank, visiting elderly people in nursing homes, making a meal for a family in need, or raising money for a nonprofit. Of course, as with any lesson we teach our children, the key to teaching gratitude is to live it ourselves. A game of “gratitude ping pong” once a year or a few thank-you notes written here and there isn’t going to make an impact on our children—but a continuous dedication to expressing gratitude for our blessings both big and small will certainly stick with them. Have you ever tried one of these ideas to teach kids about gratitude? These are great ideas! We do “thankful prayers” every night before bed. It’s been a great way to teach the concept and remember to be grateful throughout the day. We’ll have to try some of these things too!